The Museum of Ontario Archaeology welcomes you and your group to our wonderful site. If you are looking for the perfect venue for your next meeting, special event, or gathering, the Museum of Ontario Archaeology is the place for you! For information on facility rentals, meeting rooms, fees, availability, policies, and connections to local culture and industry partners, please contact us at 519-473-1360 or email us for details. 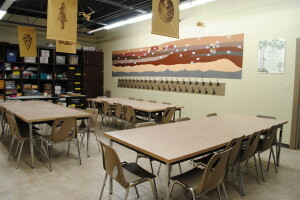 Classroom – Holds up to 30 participants and is great for hands-on workshops, kids’ birthday parties, and classes. Room?includes a cleanup sink. Theater?– Ideal for corporate events, meetings, seminars, parties, and dinners. The spacious room can seat up to 75 people in theater seating or 50 people at tables. 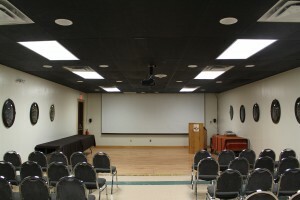 The room is equipped with audio-visual equipment and a podium. Gallery – The largest of our rental spaces, our unique gallery is great for fundraisers, meetings, galas, and special events. Interested? Call us to request more details. Enhance your event with a museum tour, cultural and educational demonstration, or catering. Advance booking is required. Click to view our Venue Rental?information sheet for rates and more details.